Smooth, creamy mushroom gravy packed with flavor and perfect for mashed potatoes or turkey. See notes at the end to make this in advance or make it gluten-free or vegan. Melt 2 tablespoons butter in a large nonstick skillet over medium heat. Add the mushrooms and garlic and cook for about 4 more minutes. Add the remaining butter. When melted, add in the flour and stir in until the onion and mushrooms are well coated. Add the milk gradually, stirring in well. Then mix in the bouillon, thyme, and soy sauce. Bring to gentle simmer and cook for about 3 minutes until thickened. Add salt to taste. If you want chunky gravy, then you’re done. 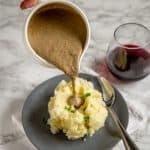 If you’d prefer creamy gravy, then pour the gravy mixture into a blender or into a container to use with your immersion blender (if using a regular blender, make sure to allow the gravy to cool before blending for safety). Blend for a minute or so until the desired consistency. Then serve. Make ahead: This can be made 3-4 days ahead of the meal. When cooled, store in a sealed container in the refrigerator. Heat over low in a small saucepan before serving. Gluten-free: To make this gluten-free, use rice flour in place of the all-purpose flour, make sure the bouillon used is gluten-free and use tamari in place of soy sauce. Vegan: To make this vegan, substitute margarine for the butter and use your favorite plain nondairy milk in place of the milk.